The HSBC China Manufacturing PMI shows weaker expansions of output and new orders. 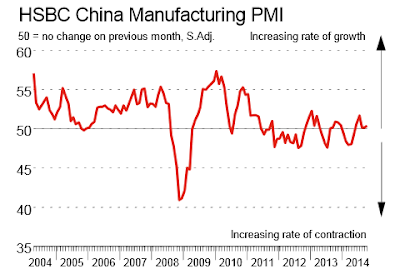 Commenting on the China Manufacturing PMI™ survey, Hongbin Qu, Chief Economist, China & Co-Head of Asian Economic Research at HSBC said: "The HSBC China Manufacturing PMI rose to 50.4 in the final reading for October, up from 50.2 in September, and unchanged from the flash reading released earlier. Compared to the flash readings, the new orders and new export orders sub - indices saw small downward revisions, but both remained in expansion territory"
Since mid-2011, Chinese manufacturing PMI has spent more time in negative (contracting) territory than expansion.